This season’s name (or phrase to express the season would be suitable) has no inherent ‘trick’ of classical Japanese poetry, like the last one we came up to. The phrase is as it is written, simple and clear. So let’s follow every Japanese word starting from the word ‘Kuma’. ‘Kuma’ means bear. The bear mentioned here is the ‘Tsuki-no-wa-guma’ (Asian black bearW) which lives all over Japan except for HokkaidoW, OkinawaW and other isolated islands in the deep forest and mountains. The bear has long been a game for hunting in Japan for eating at certain districts (but pretty rare). The gall of the bear has been known to the old Japanese as precious herbal medicine for digestive organ. The knowledge of using bears’ gall as a medicine came from China in 6th Century which developed into Sino-Japanese traditional medicine, a major medical science in Japan until about the Meiji RestorationW period in late 19th Century. So, bear was quite a familiar animal for the Japanese in the past and it still is to those who live in countryside full of nature. Going back to the phrase, the next word is ‘anani’. ‘Ana’ means hole, den or burrow and ‘ni’ is one of the Japanese particlesW showing the location. The last ‘komoru’ is a verb meaning, ‘shut oneself up’ or ‘stay’. Therefore the whole meaning of the phrase is ‘Bears start to stay in their den (for hibernation)’. A ‘winter scene’ also to other countries with winter season and animals which hibernate. What difficult names they are in English! 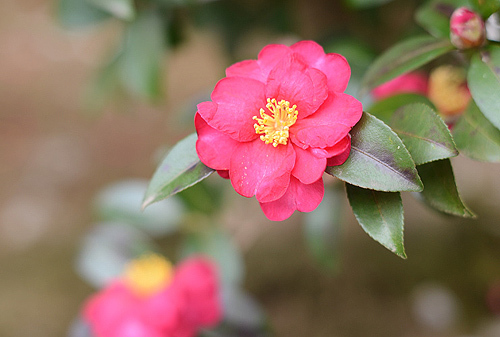 They are called ‘Yabu-tsubaki’ for Camellia Japonica and ‘Sazanka’ or ‘Kan-tsubaki’ for Camellia Sasanqua in Japanese and are very familiar plants which you find everywhere, even in big cities in Japan. Yabu-tsubaki (or simply ‘Tsubaki’) and Sazanka are the specific nouns to express this time of the year. The two are very alike, very difficult to tell apart when they are at full bloom but when they start to fall, there is a big difference between the two. Yabu-tsubakis’ petals fall all together; on the other hand, Sazankas petals fall one by one. The condition of how Yabu-tsubakis end their flowers has been disliked by BushiW (Samurais) as they reminded them of decapitation, though later when the peace reigns the land, the Yabu-tsubakis have been planted in many gardens of Bushis building their new houses in Edo (Tokyo) after early 17th Century. (There is still a superstition today on Tsubaki that you should not take them as a present for those who are sick.) 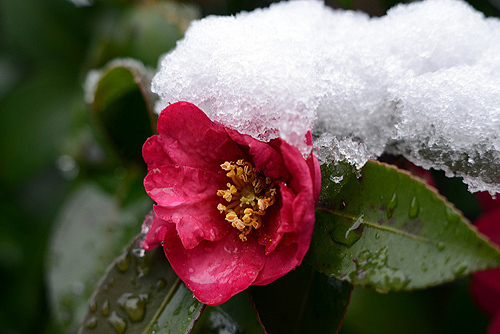 Since the flower blooms in the period when there are less flowers, they were loved and have been a major flower to be decorated in winter times at the TokonomaW of the tea rooms for Japanese tea ceremonyW. It is said to be the “Queen of Tea ceremony flowers” as the colour of the Yabu-tsubaki is so prominent within the tea room and outside which is shown through the unique shaped window where the other colours are less in season. Sazankas also decorate many gardens and tea rooms in Japan at this time of the year. 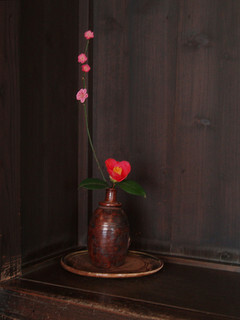 ‘Seasonal flower arrangement’, Yabu-tsubaki placed in a vase in a classical Japanese house. Photo by Nemo’s great uncle. Yabu-tsubaki has been very familiar also with its usage besides decorating flowers. The wood of Yabu-tsubaki is very hard and dense which was used for crafts in the past. The wood is very rare now, once in a while, found as expensive ShogiW (Japanese chess) pieces. 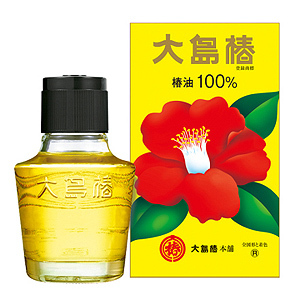 Tsubaki oil reduces hair damages from drying. Photo from Oshimatsubaki Co., Ltd. Official Site. Charcoals of the Yabu-tsubaki are high in quality used for small braziers of the riches and nobles in the past. The ashes also have usage as one of the goods used to distil SakeW (Japanese rice wine). Oils could be wrung out from the fruits like olive fruits. The oil is used for food and hairdressing. It was used as a fuel for the light before gas and electric lights prevailed. The virgin oil is very expensive now and are used only in expensive cuisine. The hairdressing containing Tusbaki oil, or a pure oil itself is still a popular hair cosmetic for both young and old women in Japan which is sold in every drugstore all over Japan. It has been a hairdressing since Edo periodW! It could be a good souvenir for those who have dry and electrostatic hair! Oyster in Japanese is ‘Kaki’, same pronunciation to persimmon in Japanese, though the accent differs, becomes season in this time of the year. It has been written on also in HaikuW and other classical Japanese poetry to indicate the season without using precise time or date. The Japanese have been eating oysters since Jomon periodW which in 15th Century, started to culture them. Unlike other cultural seafood in Japan, oysters were cooked to eat. It was in Meiji periodW when Western cultures came and were accepted in Japan that the Japanese started to eat them fresh. 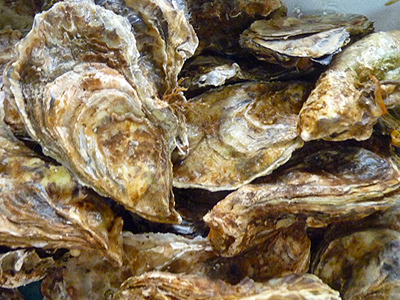 There are two major types of oysters in Japan, ‘Magaki (Crassostrea gigas) and ‘Iwagaki’ (Crassostrea nippona). The oyster which is in season now is the ‘Magaki’, a typical oyster in Japan. The latter is also called ‘Natsu-gaki’, meaning summer oyster which we will leave until summer comes to talk about. There is not much visual effect of the Kaki in classical poetry as the looks are not that attractive. Still again, by recalling the senses of tongue and nose, the taste and the smell of the oyster cooked in Japanese oyster dishes should be reminding you the season and the season’s joy. 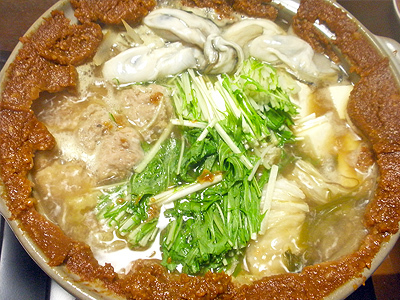 ‘Dote-nabe’, one of the typical oyster cusine of winter from Hiroshima. The traditional oyster dishes in Japan are simply grilling, ‘Kaki gohan’ (rice cooked with oyster), deep fried Kakis and ‘Dote nabe’, a caldron cooked kakis, TofuW, leeks and other vegetables and mushrooms with MisoW pasted around the rim of the caldron. ‘Dote nabe’ simply means a bank pot or dike caldron because the Miso pasted around the rim looks like the water bank. This is a traditional dish of HiroshimaW prefecture where oysters’ shipping volume is the biggest. ** There are other interpretations of ‘Nabe’ in English like ‘hot-pot’ or ‘casserole’ but we use ‘caldron’ instead because neither of those would seem to match what they really are. Deep fried Kakis are one of the best recipes in winter in Japan. Cooked at home to go with the rice or outside home, you could find deep fried Kakis in cheap to expensive restaurants or even in takeout BentoWs at this time of the year. The fries are usually eaten with either tartar sauce or Japanese Worcester sauce with both squeezing lemon juice. Kaki gohan, rice cooked with Kakis has a characteristic taste and scent of Kaki flavour seeped into the rice. If you like seafood, this is the rice you ought to try while you are in Japan at this time of the year! Preparation starting day for welcoming the New Year is called ‘Shogatsu Kotohajime’. This was the day when the Japanese start to prepare for the welcoming of the New Year like cleaning, gathering firewood for cooking New Year’s special stew called ‘Ozoni’ and collecting fresh pine branches for New Year’s pine decoration on the main entrance of the house. Now when we have gas and electric to cook and buy the pine decorations in shops, the day is a start of general house cleaning like the Spring Cleaning of Western countries. ‘Susu-harai’, meaning sweeping out the soot. Followers of the Higashi Honganji temple participating in ‘Susu-harai’. Photo from Higashi Honganji Official Site. In Japan, we use the word ‘Mukaeru’ which means ‘welcome’ for the New Year’s arrival. This is because there are ToshigamiWs (New Year gods) for every each year visiting every house who would guard the family, town and whole country. Toshigami comes and stays the whole year then leaves on the last day of the year and the new Toshigami will come and stay instead of last year’s Toshigami. This is why we use the word ‘welcome’ for the New Year, addressing it not to the time span but to the God. 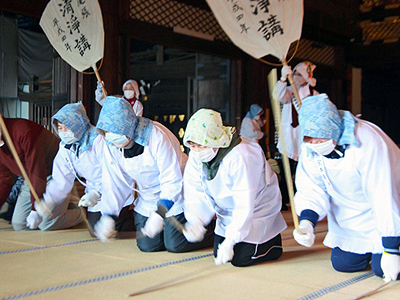 ‘Susu-harai’, Japanese Spring Cleaning for welcoming New Year in Edo period. Picture ftom Tokyo Metropolitan Library Official Site. Cleaning done at this time of the year is really cold especially when cleaning the windows outside. It is surely better to ‘Spring clean’ than to ‘Winter clean’ if we are not expecting a very special guest, Toshigami, in the New Year so that he/she could stay the whole year in a good temper. Cleaning also has a meaning of purifying the place for the New Year’s good energy, QiW to flow in and stay long.